Hooklift AL 100 Series, lifting capacity of 20,000 Lbs. 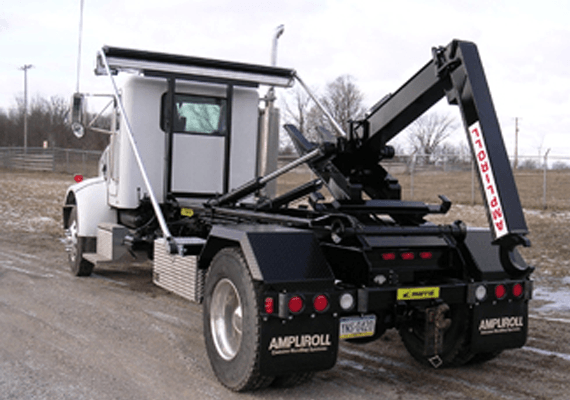 Ampliroll is designed to pick up, dump, transport and unload your containers safer and faster, that means larger profits for you. The telescopic Jib concept enables a perfect load distribution with all your bodies. Assuring versatility, durability and long life with minimal weight and maximum efficiency. A sub-frame made out of bended plate steel and cross members to be mounted on the truck frame, height 6 1/4 inches. A tilting frame, hinged to the sub-frame with a steel shaft carrying the rear centering rollers. A main arm hinged on the tilting frame with a mechanical locking mechanism that allows the dumping mode. An hydraulic system, manufactured by MARREL.